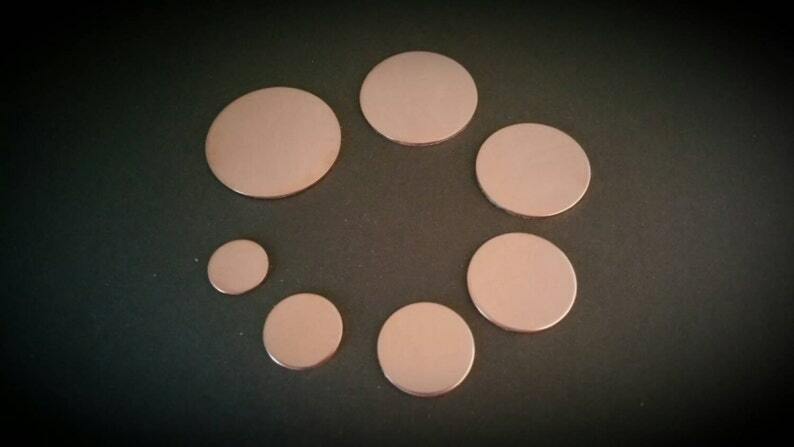 This Stamping Blank is made from COPPER and measures 3/4" round. It is a thick 18 gauge disc and will come pretumbled and deburred. Please choose a quantity from the drop down menu. Copper is a beautiful warm colored metal that can be manipulated with various techniques and finishes. You can leave as is and it will patina into a darker orangish red color or you can seal it with Renaissance wax or protectaclear. You can antique it to make it look old, or even change the colors by flame painting it with a torch (see example photo #3). These discs will come already tumbled. It's uncommon but they may still have a slight burr on the back which can be taken care of with a sanding sponge. Need a sanding sponge? You can get one here: https://www.etsy.com/listing/230468288/sanding-sponge-jewelry-tool-hand? The pink sanding sponge is a little rougher grit and is great for the back of the disc as well as a true brushed finish. The yellow sanding sponge works great to remove scratches and leaves a nice matte finish, that shows slight a slight brushed finish as well. The profits of the shop are re-invested and help pay for Jasper's college tuition, books, room and food. 2nd time ordering and absolutely perfect!!! Absolutely perfect blanks!!! Will definitely be ordering from this shop again!!!! Great product and great supplier! My order came really quickly and I am very happy with the quality of my items. Jasper sent me a few samples of also, which I hadn't ordered and I was really appreciative of that. I will be reordering. Already made some great earrings from the pewter.